No urban escape in Germany leaves a better first impression than Munich. The minute you descend upon the city centre, it becomes blazingly obvious why Munich is a favourite among the legions of travellers that etch Bavaria’s capital into their Germany itinerary. In Munich you won’t find the complexity of Berlin or a single grand monument like in Cologne. But it won’t take long to get under your skin either. From its museums to its architecture, every corner of Munich tells a story. Many of Germany’s most clichéd cultural symbols abroad—lederhosen, luxury cars, beer gardens—are rooted in the Bavarian capital. Even Germany’s infamous 20th-century National Socialism movement that changed the world over took hold in the beer halls around Munich. Whether you’re hoping to relax with a weißbier under the summer sun, browse world-class museums or hunt down classic Central European architecture, Munich doesn’t disappoint. 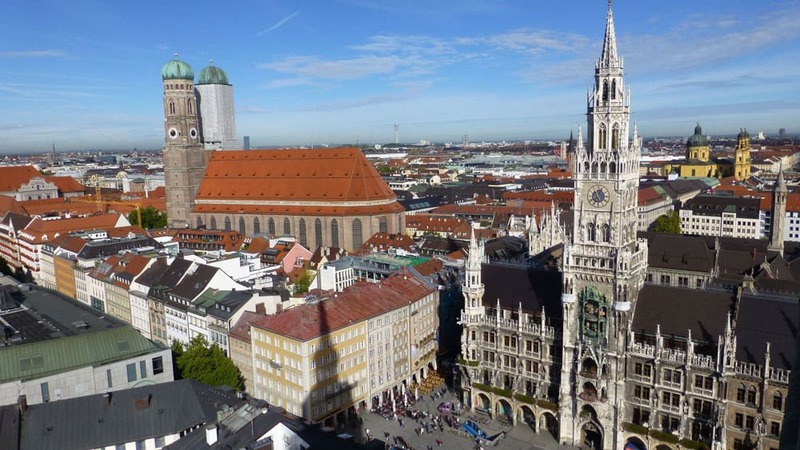 The city centre is compact, perfect for exploring Munich’s best attractions by foot. Even if you choose to stay a little further afoot, getting around Munich with the U-Bahn is fairly cheap and easy. Besides the mass of things to see in Munich, just beyond the city lies some of the best places to visit in Germany. Fantastical castles and palaces fashioned from the mind of a mad king, alpine-backdropped lakes and perfectly preserved medieval towns are all accessible on quick day trips from Munich. When I decided to live in Munich for a couple months, knowing nearly nothing about the city, I somehow stumbled upon the Englischer Garten within my first few days. I loved it from day one; it quickly became a staple in my routine. Whenever I needed a mini-escape from the city, I’d find myself lazing on the lawn or wandering among the shady wooded trails of the Englischer Garten. Slightly bigger than Central Park in New York, the Englischer Garten is easily one of the best urban greenspaces in all of the Europe. Likely one of the oddest, too. Don’t be surprised to see Germans letting it all hang out to catch rays on every—and I do mean every—part of their bodies on the open green expanse of Schönfeldwiese. If you’d rather not expose yourself (or be subjected to it), head up to the artificial streams cutting through the Englischer Garten where amateurs surfers dream of Costa Rica as they balance themselves on tiny man-made waves. 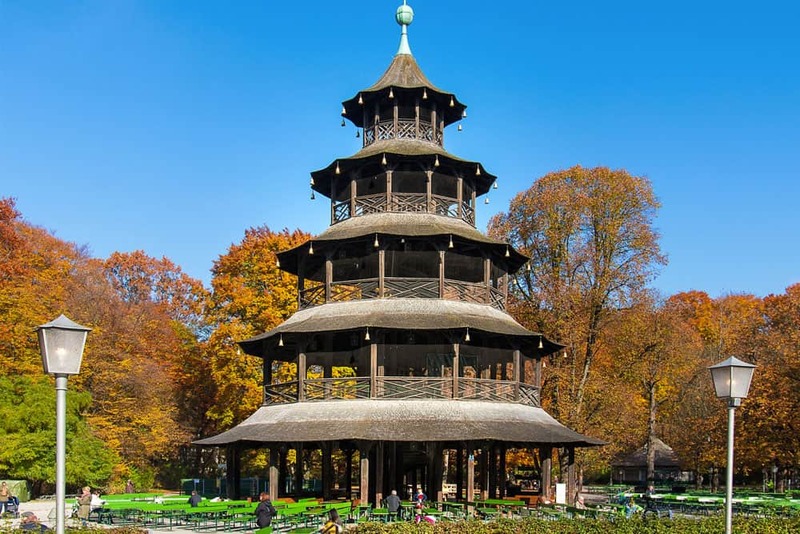 My personal favourite place to while away an afternoon in the Englischer Garten is the Chinesischer Turm (Chinese Tower). On sunny warm days, thousands flock to the massive beer gardens surrounding the tower. Although not the cheapest beer garden in Munich, your Euros will go further here than in most tourist-centric locales like Hofbrauhaus. For a more subdued Englischer Garten experience, escape the crowds by heading over the Isarring into Hirschau, the quieter northern section of the park. From here, the park stretches into the far northern recesses of Munich’s city centre along relaxing trails and greenery. There’s even a few small beer gardens tucked away to help you recharge! Nearly every major street venturing east of Ludwigstraße/Leopoldstraße leads to a path that ends in the Englischer Garten. To see the garden from the southernmost entry point, start off at the intersection of Prinzregentenstraße and Lerchenfeldstraße near the Bayerisches Nationalmuseum. The Odeonsplatz, Universität and Giselastraße U-bahn stations all provide good access to the southern part of the park. Visiting Munich for the first time? 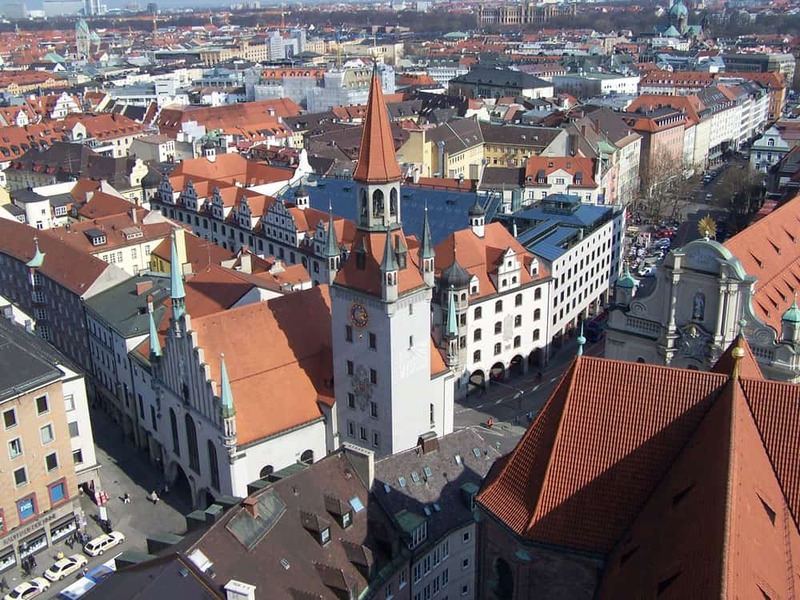 Start exploring the city from Marienplatz, the main square of Altstadt (Old Town). 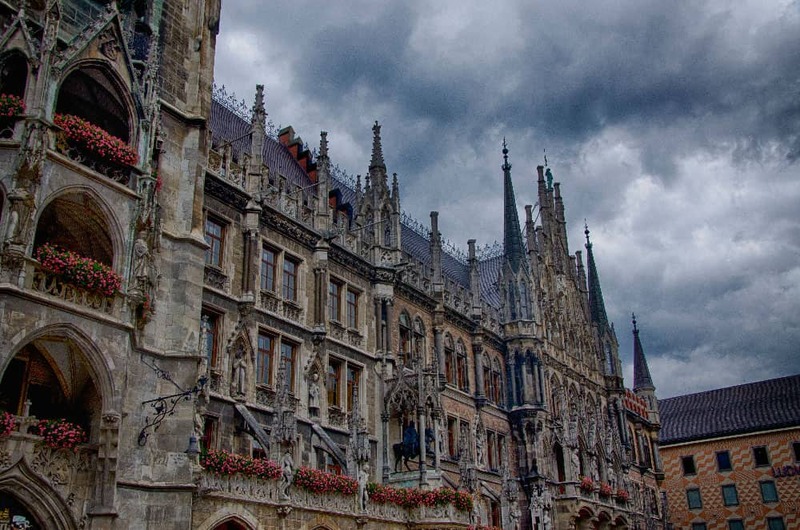 Gather around the Mariensäule, a column sent skyward in 1638 to commemorate Bavaria’s victory over Sweden in the Thirty Year’s War, to marvel at the neo-gothic New Town Hall (Neus Rathaus). Timing your visit to Marienplatz at 11am (or 12pm and 5pm in the summer) hammers your eardrums with the slightly off-key musical stylings of the the famous Rathaus-Glockenspiel in the tower of New Town Hall. The Glockenspiel spouts out more than just a tune. Watch as a scene, fit for an ancient Bavarian soap opera, unfolds before your eyes. The Glockenspiel depicts tales of a 16th-century Bavarian royal wedding, an epic medieval battle between two shining knights, and a jubilant “cooper’s dance,” signaling the end of the plague in Europe. To get to Marienplatz, simply hop on the U-bahn and S-bahn. Marienplatz Station is a major station with easy connections to areas across the entire city. I couldn’t possibly wrap up a session on what to do in Munich without mentioning the world’s most famous beer festival, Oktoberfest. I’ll admit that Oktoberfest isn’t my favourite. The atmosphere and energy is undeniable. But so are the crowds. After a couple litres of Paulaner or Löwenbräu, when the bathroom lines seem to extend all the way to Augsburg, the festivities seem to lose their luster. Nevertheless, attending Oktoberfest is a once-in-a-lifetime experience that any serious beer enthusiast must entertain. Since the first Oktoberfest, this Volkfest has taken place on the Theresienwiese. The closest U-bahn stop, also called Theresienwiese, is one quick stop away from München Hauptbahnhof on the U4 and U5 lines. From the Hauptbahnhof, Oktoberfest is about a 15-minute walk away. 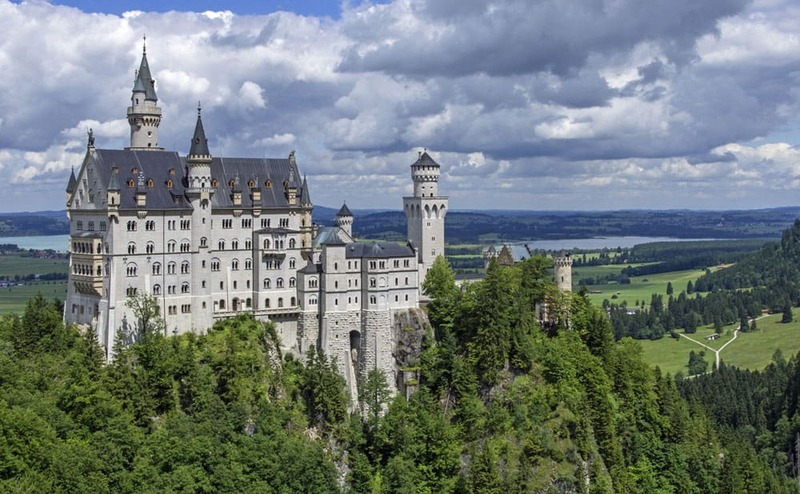 Even though it’s far outside the city, no list of best things to do in Munich is complete without mentioning Bavaria’s star attraction and an absolute must-see stop on any Germany road trip, Neuschwanstein Castle. Located near the town of Füssen, about 2 to 2.5 hours from Munich, Neuschwanstein Castle is as magical as anything popping off the pages of a medieval fairytale. Neuschwanstein Castle is the Romanesque brainchild of King Ludwig II, a Bavarian ruler whose opulent tastes and hints of eccentricity made him one of Germany’s most infamous royals. Unlike nearby Linderhof Palace, Ludwig’s grand vision for Neuschwanstein was never realized within his lifetime. The king spent only 11 nights in the castle before his death in 1886. Ironically, less than a couple months after Ludwig’s passing, Neuschwanstein Castle was opened to the public who immediately began to enjoy the fantastical fruits of his imagination. It’s been one of the Germany’s top tourist attractions and has topped the list of Germany’s best castles ever since. Dodge through the crowds (as many as six thousand visitors per day during high season!) and grab your entrance ticket (€13) in the village of Hohenschwangau before heading off to Neuschwanstein Castle. Tickets are for guided tours embarking at specific times—be sure to leave yourself ample time to arrive at the castle before your tour. Figuring out how to get from Munich to Neuschwanstein Castle isn’t so difficult. First, you’ll need to travel from Munich to the town of Füssen. Direct trains depart München Hauptbahnhof for Füssen about every two hours while trains requiring changes depart even more frequently. Most services take between about two and two-and-a-half hours. The small village of Hohenschwangau, sitting about 4 kilometres from Füssen, requires a local bus to reach. Quicker and more convenient is to rent a car in Munich. With your own set of wheels, you’ll have a chance to visit not only Neuschwanstein Castle but also Linderhof Palace, a favourite refuge of King Ludwig II set among the backwoods of Bavaria. TIP: To avoid the hassle of driving through the sometimes ludicrous Munich traffic and still fit in both Neuschwanstein and Linderhof in one day, snag a spot on the Royal Castles Day Trip from Munich! Walk: From Hohenschwangau, budget about 30-40 minutes to walk up the steep 1.5-kilometre stretch to the castle. Horse-drawn carriage: Travelling by carriage can get you most of the way up without much hassle, stopping about 5-10 minutes short of the castle. Going uphill will run you about €6 while the descent from the castle sits at half the price (€3). Shuttle bus: Like the horse carriages, buses from Hohenschwangau will take away much of the strenuous walking to Neuschwanstein. The buses drop passengers off near Marienbrücke, about a 10- to 15-minute downhill walk to the castle. Buses are cheaper than the horse-buggies, costing just €2.60 for the return trip. Peek just south of Marienplatz for a glance of Munich’s oldest Catholic church, Peterskirche (St. Peter’s Church). In one form or another, Peterskirche has occupied this prime location in central Munich since 1180. Fire and war couldn’t shake St. Peter’s Church existence. Although the current church is a post-WWII reconstruction completed only in 2000, little detracts from its beauty. Inside Peterskirche you’ll find magnificent artistry including Gothic paintings by Jan Polack, ceiling frescoes by 18th-century artist Johann Baptist Zimmermann and a gilded high alter by Erasmus Grasser. When poking around St. Peter’s Church also sneak a peek at the macabre skeleton St. Mundita in the chapel. Adorned with gold and precious stones, this creepy little attraction is sure to send shivers down your spine! Of all of the reasons to visit Peterskirche, none is more compelling than climbing up the 56-metre church tower. About three hundred steps stand between you and best views of Munich. (Better than those from New Town Hall, in my opinion.) There’s even a quick colour-coded visibility chart at the stairway entrance to give you an idea of how far across the city you will be able to see! Once at Marienplatz, head one block south on Rindermarkt. Peterskirche will be on your lefthand side. Legend swirls around Frauenkirche. There’s always been suspiciousness surrounding how such a grand church was completed in just twenty years. 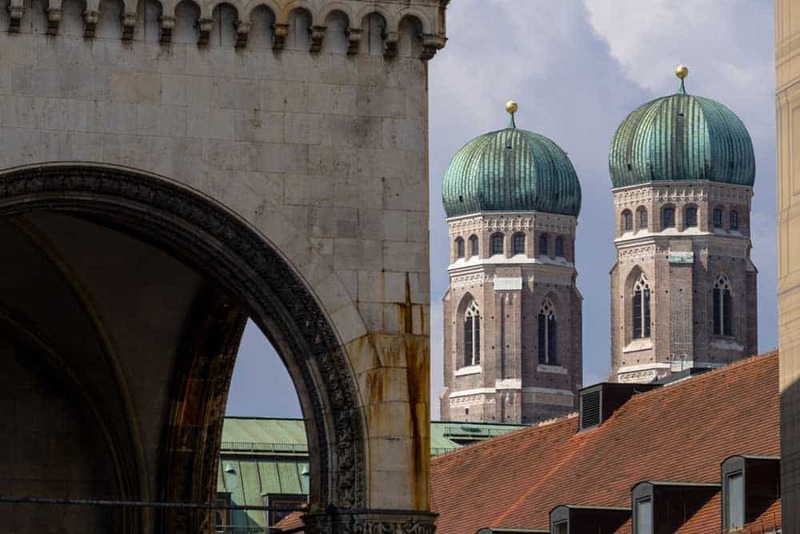 Simply stand below the Frauenkirche’s twin domed towers, soaring almost 100-metres above Munich, and you’ll see why the controversy spins heads. But there’s a simple explanation: the devil did it. As one Münchner folk tale explains, the Frauenkirche’s builder struggled to erect his grand vision under budgetary constraints and asked the devil for help. The devil obliged. To secure financing the builder agreed to build the church with no windows. Once Frauenkirche was completed, the builder invited the devil back to see his creation. From the foyer, where the devil stood, no windows could be seen. The massive columns obscured the light. Not yet satisfied the devil moved further. As he walked past the first columns and the light beamed in, the devil realized he was tricked. In a fit of rage, he stomped the floor and spun out into the city. The “Devil’s Footprint” still stands at the entrance of the Frauenkirche. Besides (literally) stepping into local legends, the Frauenkirche is home to a sizeable art collection and a crypt with the bodies of several members of the Bavarian House of Wittelsbach. With the immense size of Frauenkirche’s towers, it’s hard to miss it. Walk north up Weinstraße, the street to the left of New Town Hall in Marienplatz. Either the first or second left will lead to Frauenplatz, the square in front of Frauenkirche. 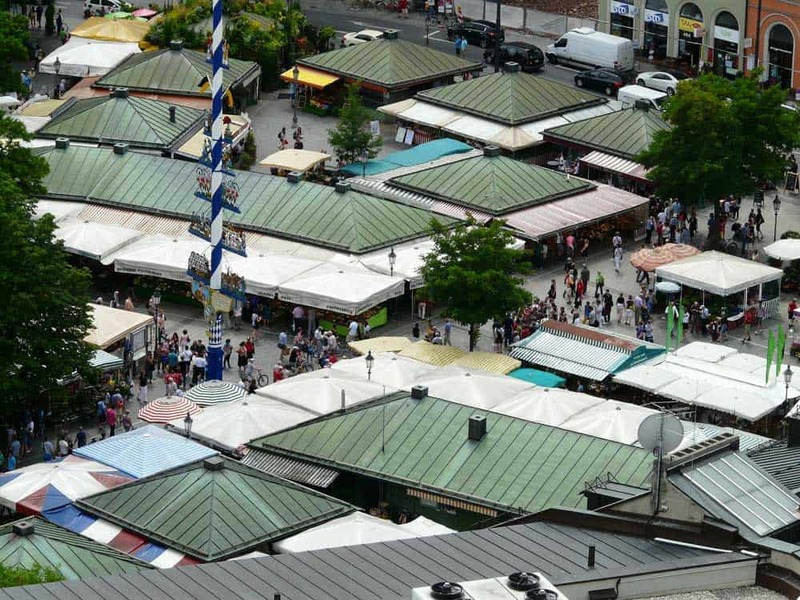 A history of over two hundred years predates Viktualienmarket, Munich’s biggest farmer’s market. Once located on nearby Marienplatz, Viktualienmarkt is one of the best places in Munich to grab a quick snack or to find fresh produce to fill your mini-bar. Well over a hundred stalls are scattered around Vikualienmarkt selling everything from fresh meats and sausage to exotic fruits and vegetables. Poke around and fill your belly with one of Viktualienmarkt’s specialities, leberkäse, a surprisingly delicious liver pâte loaf. Wash down your snack with a 1-litre Mass of one of Munich’s best brews at Viktualienmarkt’s beer garden. From Marienplatz, walk past the gate at Old Town Hall on the east end of the square. Turn right at the first street to enter into Viktualienmarkt. 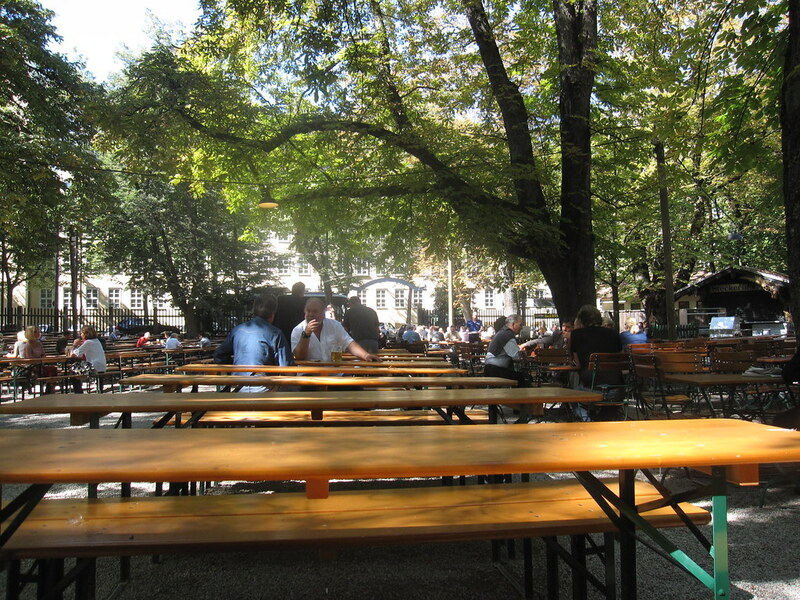 When visiting Munich, you can never get enough of the beer gardens. And Augustiner-Keller is one of the best. 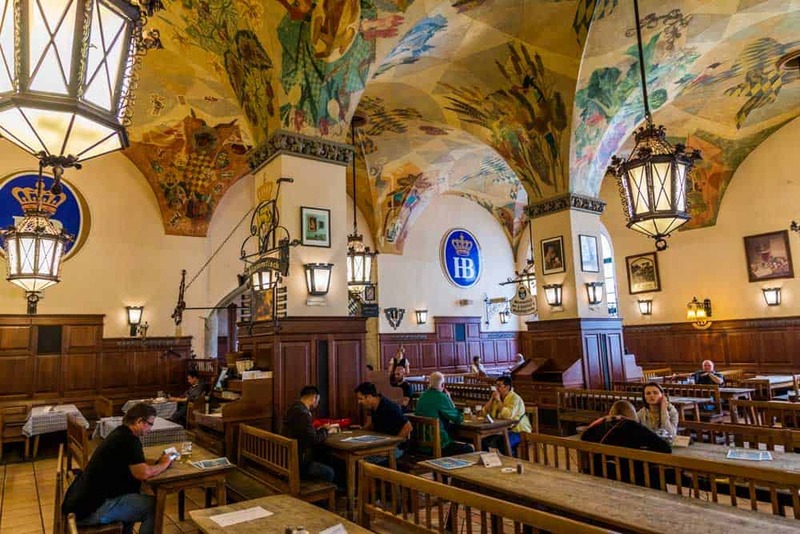 Unlike the more famous—and far more touristy—Hofbräuhaus beer hall, Augustiner-Keller is tucked away just enough from the Altstadt tourist enclave to attract a more local crowd. Pick your spot among one of the five thousand or so seats to enjoy a cool Augustiner Edelstoff under the shade of chestnut trees. For the full Augustiner experience, don’t forget to soak up the suds with a hearty pretzel snack! TIP: Prefer smaller crowds? Drop by the cosier Augustiner Bräustuben, a traditional restaurant with an classic old German tavern vibe not far away on the southern side of Hackerbrücke. Take the S-bahn to Hackerbrücke, exiting to the north onto Grasserstraße. At Anrulfstraße, one full block north of the station, cross the street and turn right. The Augustiner-Keller will be on your left (Anrulfstraße 52). For Augustiner Bräustuben, walk south of Hackerbrücke. Cross Landsberger Straße, turn right, and walk one block. The restaurant will be on the corner. 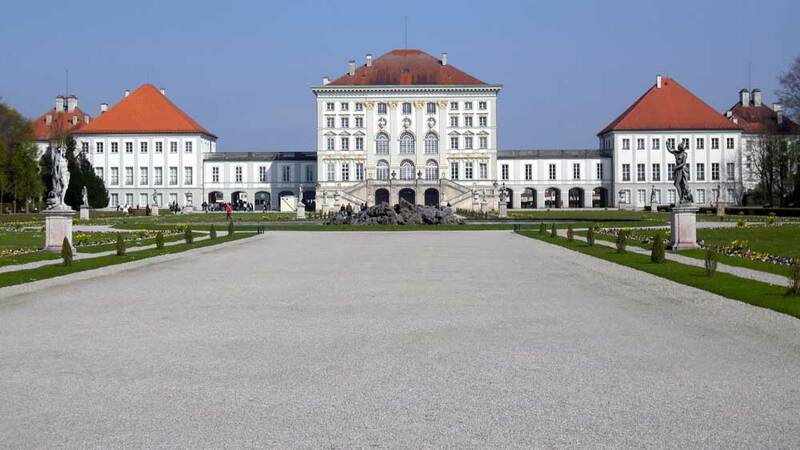 You don’t have to go all the way to southern Bavaria to see how the other half lived; Nymphenburg Palace will do the trick! The former summer residence of the Bavarian royal family is one of the most-visited tourist attractions in Munich and a must-see while visiting Munich. Nymphenburg Palace was first conceived in 1664, celebrating the birth of Maximilian II, a soon-to-be major influencer of trans-European affairs. Over five generations of Wittelsbachs slapped their mark on Nymphenburg Palace, expanding its gardens and adding auxiliary buildings to complement the central palaces. 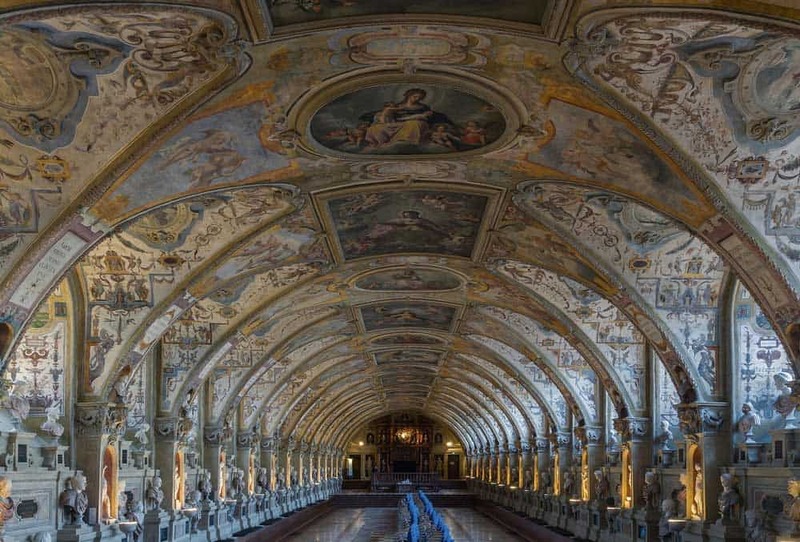 Visitors can tour the inside of the palace, soaking in the masterful work of famous Bavarian architects and artists and the Baroque, Rococo and Classical architectural styles that dominate Nymphenburg Palace’s halls. Besides the palace’s interior and museums spread about the grounds, the gardens of Nymphenburg Palace are an impressive retreat from Munich city life. Spend a couple hours wandering among the greenery to uncover its hidden ponds and sculptures. To find your way to Nymphenburg Palace, hop onto tram 17 at München Hauptbahnhof or Karlsplatz (Stachus). Exit at the Schloss Nymphenburg stop. Cross Menzinger Straße to get to the grounds. Like Berlin, Munich has it’s own Museuminsel (Museum Island). But instead of being a small enclave with several museums to choose from, Munich’s Museuminsel has just one. And it’s a good one. The Deutsches Museum in Munich is the world’s largest science & technology museum—and one of the first of its kind in the globe. Over 1.5 million visitors saunter through the interactive exhibitions every year, always leaving with a better grasp on the world of technology around them. Among the more popular and interesting exhibits is the flight simulator and planetarium where you’ll navigate the universe with help of a state-of-the-art fibre optic star projector. Note: Many of the exhibits at the Deutsches Museum are currently undergoing a refurbishing and will not be opened again until 2019. 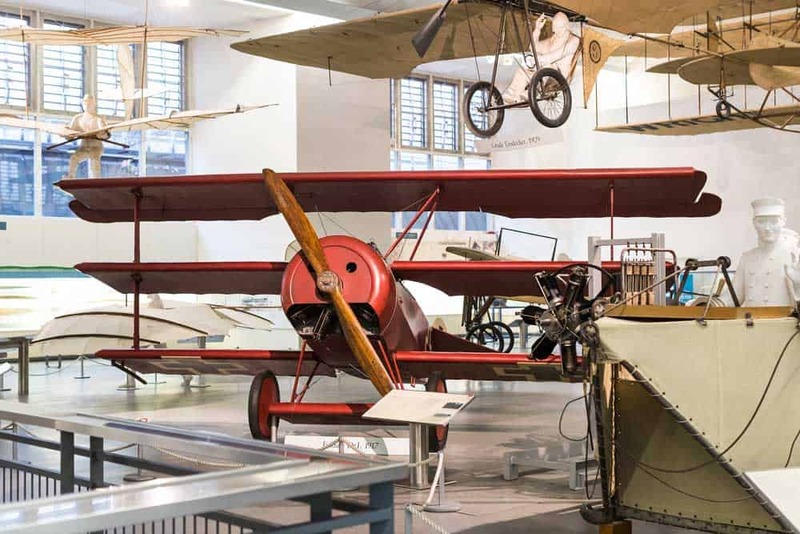 Deutsches Museum is open all year-round from 9:00-17:00 with closures for major holidays. Admission is €11 for adults and just €4 for students. There are both S-bahn and U-bahn stops close to the Deutsches Museum. With the S-bahn, take any line to München Isartor. Walking south east on Zweibrücken Straß towards the Isar River, the Deutsches Museum will be on the island on the right halfway across the bridge, Ludwigsbrücke. By U-bahn, the trip is slightly less convenient. Find your way to Fraunhoferstraße on the U1, U2, U7, or U8. Walk about two blocks along the north bank of the Isar on Erhardtstraße and cross over to Museuminsel with a right turn on Boschbrücke. Auto enthusiasts simply should miss a trip to the BMW Museum in Munich. The 60-minute tour (€13) guides you through 120 of BMW’s sleekest cars and motorcycles—and the engines that power them. The permanent exhibition of the BMW Museum covers 90-odd years of the automaker’s history in seven exhibition houses. Each exhibition house tackles a specific theme. Science geeks will get a kick out of the House of Design and the House of Technology. Gear heads will leave the House of Motor Sport, House of the Motorcycle and House of the Series equally enthralled. In addition to the permanent exhibition, there’s a rotating temporary exhibition at the BMW Museum. The exhibition at time of writing, 100 Masterpieces, runs until the end of September 2017. The nearby BMW Welt (free admission) is also worth a gander. The BMW Museum is located near Olympiapark. Take the U2 (Red) U-bahn line to Olympiazentrum. From the station, head south on Lerchenauer Straße. 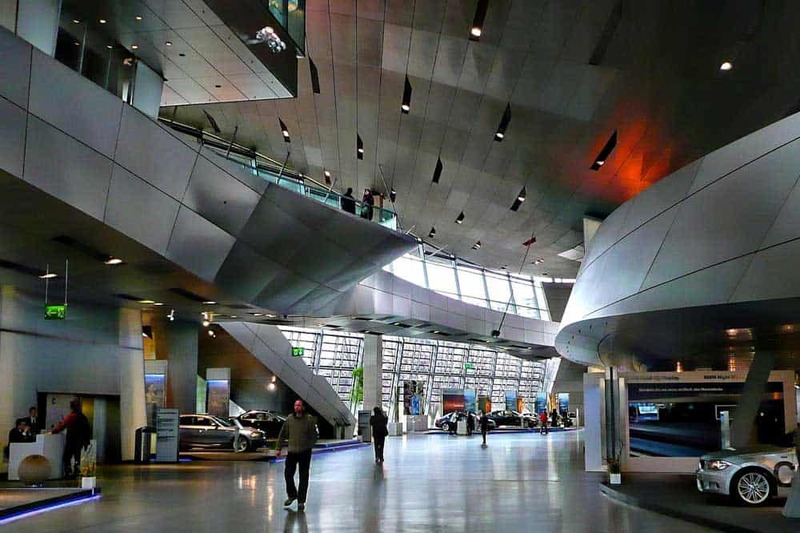 You’ll find the BMW Museum across the street from BMW Welt. Set aside the better part of an afternoon if you want to tackle the Munich Residenz, a late-14th century palace that was the official home of the Bavarian royal family until 1918. Over the centuries, rulers added to a mishmash of architectural styles to the palace. The result is an eclectic collection like none other in the city. Like many of the top attractions in Munich, little remained of the palace after World War II. Rebuilt and re-opened by 1958, Residenz Museum today covers over a hundred rooms chock full of all the opulence expected from royalty. Don’t miss the Hall of Antiquities (Antiquarium), a vaulted Renaissance hall decorated with 16th-century frescoes. The spectacular Rococo-style Cuvilliés Theatre is also worth checking out. From Marienplatz, walk north on Dienerstraße, the street clinging to right-side of New Town Hall. Three blocks up is Max-Joseph-Platz. The Munich Residenz is accessible from here. Nearly every tour of Munich features a quick stop at Hofbräuhaus, the most famous beer hall in the city. 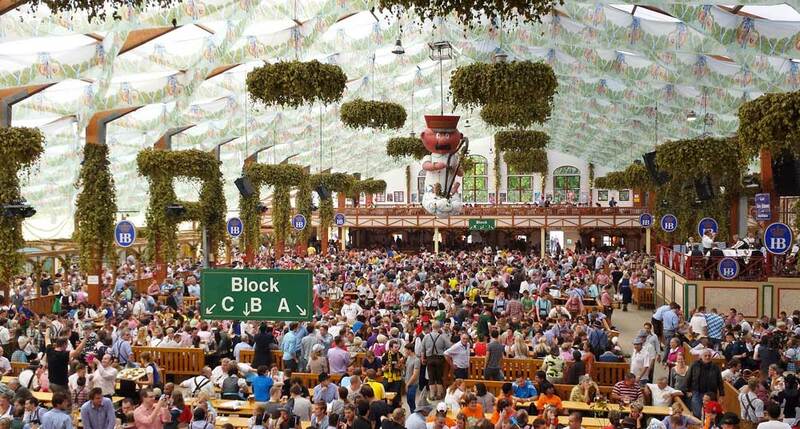 To be sure, better beer halls and beer gardens exist elsewhere in Munich. But the history of Hofbräuhaus speaks for itself. No traveller should leave Munich without popping in for an oversized pint. To pinpoint the beginnings of Hofbräuhaus you’ll need to dig way back. Frustrated with Munich’s beer selection, Duke Wilhelm V started the Hofbräuhaus in 1589. The original beer hall was much cosier than the current incarnation. Years of renovations—and a full rebuild after World War II—expanded the Hofbräuhaus to what you’ll see today. On offer is a selection of Hofbräu’s finest beers (mega-sized, of course) and traditional Bavarian dishes. My personal favourites at the Hofbräuhaus are the spätzle, a sort-of Bavarian Kraft dinner on steroids, and any one of the succulent pork dishes with dumplings. Wash it all down with a satisfying Münchner Weisse to top out the experience. Besides the beer (which is actually quite good for a tourist trap! ), the best part of any visit to the Hofbräuhaus is watching the petite traditionally dressed female servers slamming over half a dozen one-litre mugs of beers on the table at once without spilling a drop. When beer-mug-induced carpal tunnel flares up after just a few sips from a Mass, you’ll see just how impressive the feat really is! From Marienplatz, it’s a quick walk to Hofbräuhaus. Exit Marienplatz to the east through the Old Town Hall gate. Turn immediately left onto Sparkassenstraße, following it two blocks north. Turn right on Münzstraße. At the next block, turn left onto the pedestrian street of Platzl. The Hofbräuhaus is the first building on the right, across from the Hard Rock Café. The 1972 Munich Olympics are remembered for all the wrong reasons. Setting aside the tragic Munich Massacre, Olympiapark is a reminder of the Games’ more joyous moments, and one of the coolest Munich attractions. 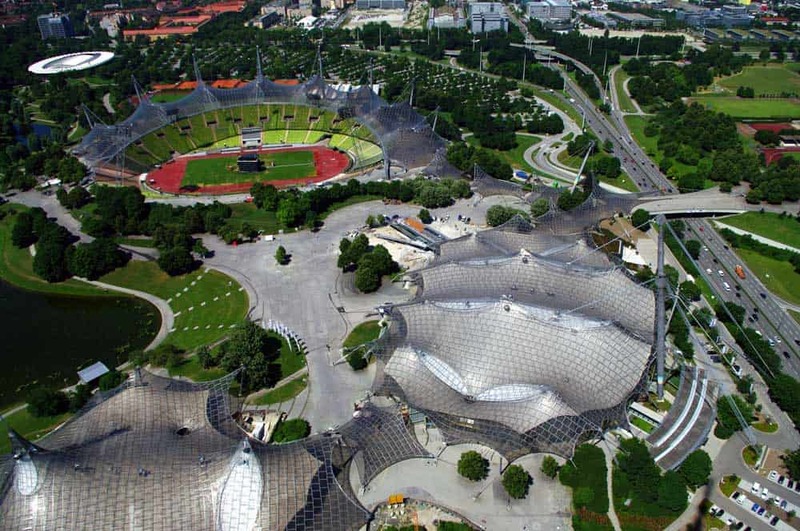 Olympiapark made an immediate impact on the world upon its unveiling in 1972. The first Olympics held in West Germany post-WWII presented a new perception of Germany, reflecting a renewed optimism and gaze towards the future. The unique architecture of the park, featuring futuristic acrylic canopies suspended by metal ropes, turned heads as it was like nothing ever seen at the Olympic Games. Today, Olympiapark is an interesting urban park ripe with recreational opportunities. Most exciting is the roof climb (€43), a 120-minute walk among the acrylic glass roof canopies featuring incredible views of the city and beyond. For an extra €30, end your roof climb with the adrenaline-pumping “flying fox,” a 200-metre zip-line flying across the entire Olympic stadium. The most convenient way to Olympiapark is by U-bahn via the Olympiazentrum station on the U2 (Red) line. From the station it’s about a 5-minute walk south past BMW Welt to the stadium. 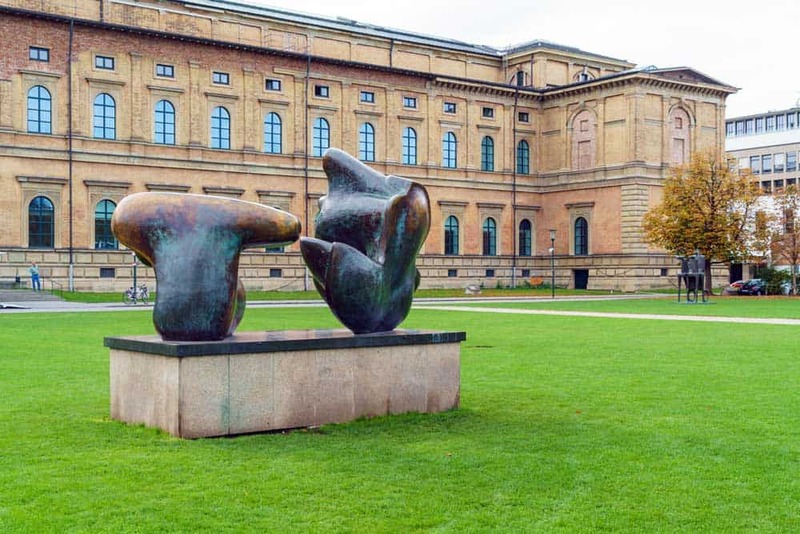 Lovers of European art will find sanctuary at Alte Pinakothek. The over-800-strong collection here focuses on Europe’s “Old Masters,” spanning from the 14th through the 18th century. What you’ll find at Alte Pinakothek are the remnants of the Wittelsbach dynasty’s personal art collection. William IV first started the family’s collection is the 16th century, passing his love of art down the line through the generations. The galleries are heavy with German and Dutch artists, ranging from Albrecht Dürer and Peter Paul Rubens to Matthias Grünewald and Rembrandt. A handful of Italian, French and Spanish pieces—including da Vinci, Poussin, and Velázquez—round out the collection. The closest U-bahn stop to Alte Pinakothek is Theresienstraße. Exit the station and walk east along Theresienstraße. The Alte Pinakothek is about two major blocks up on the righthand side. Alternatively trams 27, 28 and N27 from Karlsplatz (Stachus) will drop you off in front of both the Alte Pinakothek and Neue Pinakothek. Along with the Alte Pinakothek, the Neue Pinakothek is the home to the other half of the Bavarian monarchy’s personal art collection—and then some. The exhibition of about 400 paintings at the Neue Pinakothek focuses on European art between the late-17th to the 20th century. The original collection, first brought forth by King Ludwig I, was heavy on German Romanticism and local Munich artists. It was soon expanded to include works by popular European Impressionists, Post-Impressionists, and Expressionists. 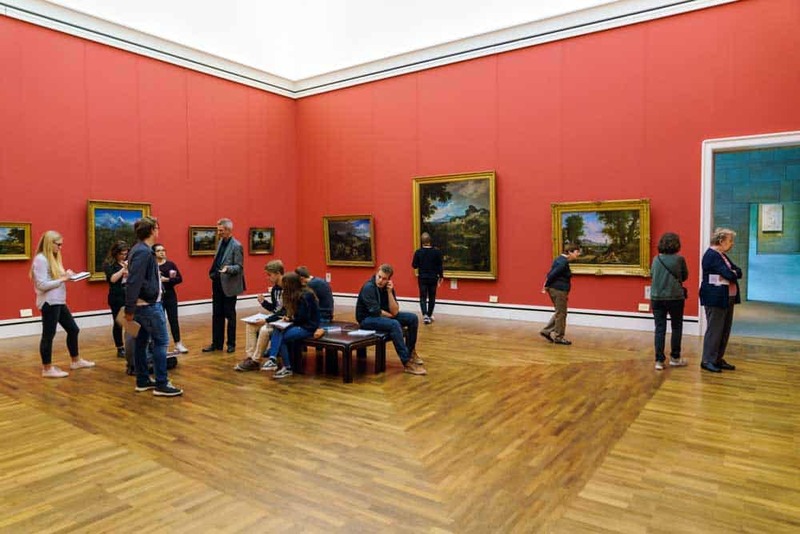 Among the most famous artists represented at the Neue Pinakothek are Caspar David Friedrich, Thomas Gainsborough, Henri Matisse, Édouard Manet, Claude Monet, and Paul Cézanne. The Neue Pinakothek is directly across Theresienstraße from the Alte Pinakothek. The most direct route is tram 27, 28, and N27 from Karlplatz (Stachus). From the Theresienstraße U-bahn station, it’s less than a 10-minute walk to the east to Neue Pinakothek. Although it’s Germany’s second-largest city, choosing among the best places to stay in Munich isn’t overly difficult for most travellers. Many of the top points of interest in Munich lie within the city centre—or at least within a short metro or tram ride of it. Cocoon Hauptbahnhof: A cool budget-friendly hotel inspired by Bavaria’s alpine ski resorts. It’s located close to the Hauptbahnhof and is super convenient when you’re crunched for time in Munich. Aloft München: A modern 4-star hotel with hip & stylish design located next to the Hauptbahnhof to make sightseeing in Munich an absolute breeze. Sofitel Munich Bayerpost: One of the top luxury hotels in Munich, this 5-star property occupies the historical former post office building next to the central train station. Amenities like a sun terrace and on-site spa put this hotel among the city’s most relaxing. Need to unleash your wild side with some wicked Bavarian brews? If Oktoberfest is out of the cards, get your fill of Munich’s beer scene at either the Chinesischer Turm in the Englischer Garten or Augustiner-Keller, two of Munich’s best beer gardens. Craving one of Germany’s most classic scenes? Carve out one day in Munich for a day trip to Füssen to dazzle at Neuschwanstein Castle, one of the finest castles in all of Europe.